HappyFox Chat iOS App allows you to handle chat requests right from your iPhone, anytime, anywhere. Get Instant Push Notifications when there is a New Chat Request. Respond to Chat Requests Instantly, right from your iPhone device. Transfer Chats to Other Available agents. Never Miss Any Chat Anymore! 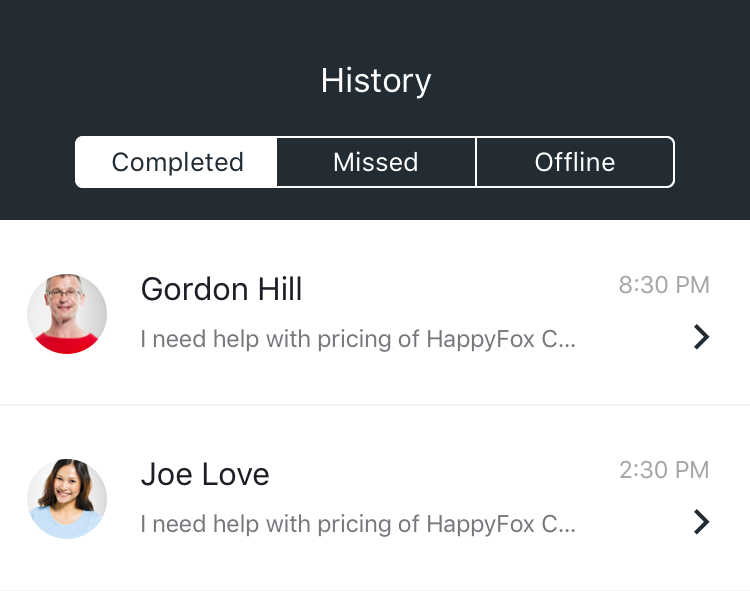 Introducing HappyFox Chat iOS App that allows you to respond to your customers on the go, anytime, anywhere, without having to miss any chats. Tap on the HappyFox Chat icon on your iPhone device. Login using HappyFox Chat credentials. If you've forgot the login password, click on "Forgot Password" link that prompts you to enter the email address with which you've signed up for HappyFox Chat. As soon as you're logged into your HappyFox Chat Account, you will be promoted with a system alert, which will ask if you like to receive Push Notifications from HappyFox Chat app. Clicking on "Ok", will send Push Notifications from the app. (If you don't wish to receive notifications click on "Don't allow"). Dashboard has two items in the tab bar. Chat Dashboard will be displayed on the home screen of the app. Online Visitors - Displays the number of online visitors on your site. Active Chats - Displays the number of active chat conversations that you're currently handling. Agents Online - Displays the number of Agents Online. Agents List Button will be displayed on the top right corner of the Chat Dashboard screen. Tapping on it will show the List of All Agents who are Available, Online and Offline. 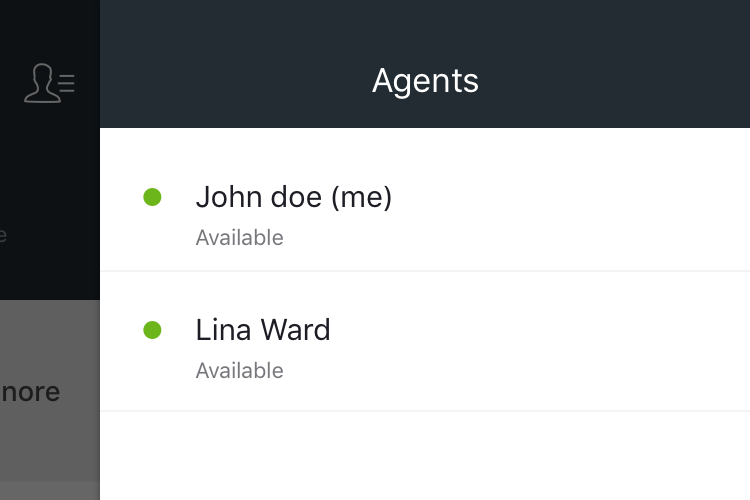 Agents who are in "Available" status will be displayed in Green color. Agents who are in "Idle" status will be displayed in Orange color. Agents who are in "Offline" status will be displayed in Grey color. Also swiping the screen from right to left will display the Agents Online. History page comprises all the Chat Transcripts with respect to your HappyFox Chat Account. Completed - Completed will have all the Completed Chat Transcripts along with the Status Messages. 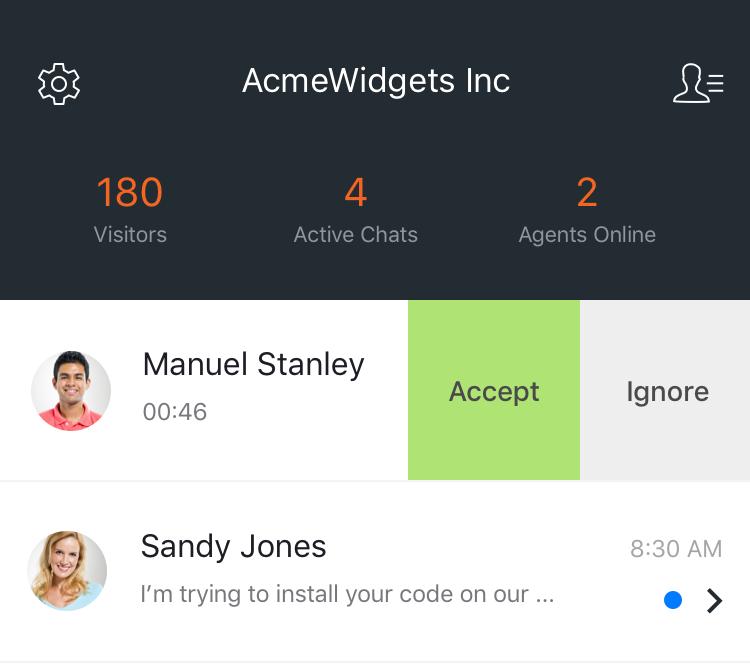 Displays Visitor Name along with Agent's name on the top of the screen. It has Chat Conversations along with Status messages and the respective time stamps for the same. Missed - Missed will have the Missed Chat Transcripts with the Status messages. Offline - Offline will have the Offline Messages that were collected when no agents were available to take the chat. Settings button is located on the top left corner of the home screen. Display Company Name, Agent's Name and Agent's Email Address. Availability Toggle - By default it will be Toggled ON. Toggling it OFF will make you not available to take any new incoming chat requests. Below it is the HappyFox Chat icon, which on being clicked will be redirected to the homepage of HappyFox Chat website. The version of HappyFox Chat iOS app will be displayed below the logo. The Bottom of the Settings page will have "Need Help?" hyperlink which on being tapped will take you to a New Tab which will prompt you to create a new Issue to report. Clicking on New Issue will create a ticket in the HappyFox Chat after which a support personnel will reach out to you to support regarding the issue reported by you. Logout - Logout option is available on the top right corner of the Settings screen which on being tapped will ask for a confirmation after which you will be logged out of your HappyFox Chat Account. When there is a New Chat Request Notification, it will be displayed on the Chat Dashboard with "Accept" and "Ignore" Button. Tapping on "Ignore" will ignore the chat yet keep it on hold, where you still have the option to Accept the chat by swiping the screen from right to left on the screen. When you're on a conversation with the visitor, and if there is a new chat request notification or a new message from the other visitor, it will be notified through in-app notifications. 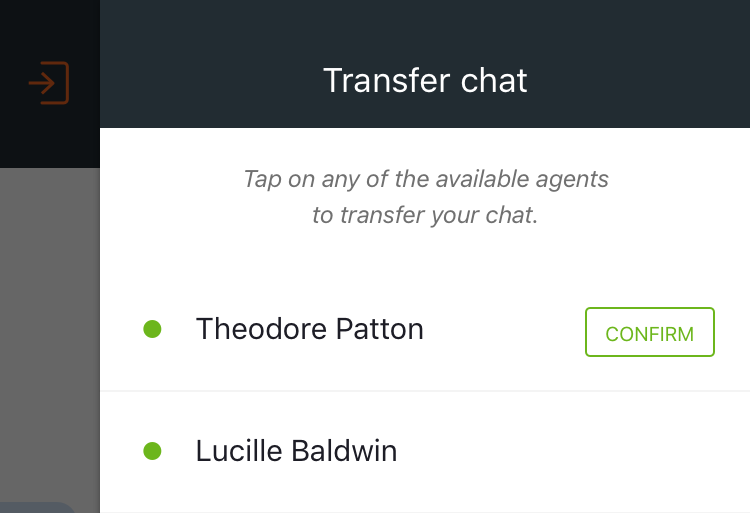 Chat Transfer - On the Chat Window screen, to the left of the chat text box, there is an icon which on being tapped will allow you to transfer the chat to the other Available Agents. End Chat - Clicking on End Chat button on the top right corner of the Chat window will end the chat conversation with the visitor.